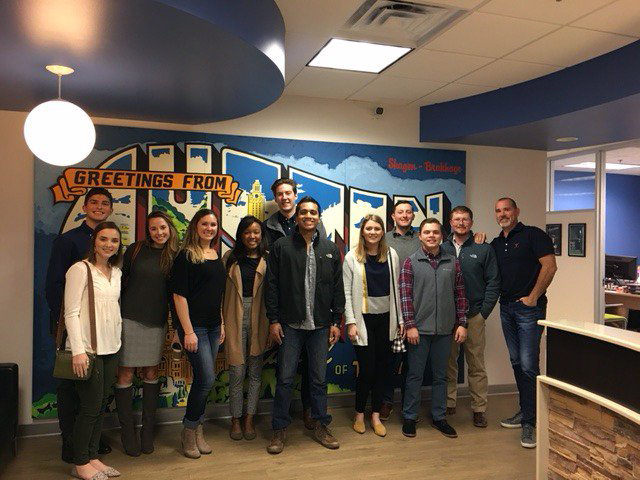 Members of ACU's Collegiate Entrepreneurs Organization recently toured Q1 Media in Austin to hear the inside story of the startup business. Abilene Christian University’s chapter of Collegiate Entrepreneurs’ Organization was named 2017 Global Chapter of the Year for the third year in a row at the CEO Global Conference and Pitch Competition in Tampa, Florida. The Global Chapter of the Year award is given to a CEO chapter that demonstrates excellence in organizational development and the ways in which the chapter offers a meaningful entrepreneurship experience for students at the respective university. ACU took home the honor and a $250 cash award, outperforming larger universities such as Texas A&M University, Florida State University and Iowa State University. ACU’s CEO president Taylor Spencer, a senior business marketing and management student from Joplin, Missouri, said winning the award again this year was a great opportunity for ACU to be recognized on a national scale, especially since no chapter has won three times in a row before. “It’s cool to see how a small and private school in west Texas has the abilities and the programs to help their students go out into the world and get real experience,” Spencer said. ACU’s CEO chapter has had a hand in developing numerous programs and opportunities to spread awareness and instill practical skills of entrepreneurship in students such as Wildcat Ventures, Entrepreneur Speaker Series, Springboard Idea Challenge and Startup Week.